Miami-Dade's New High-Speed 50 foot Aluminum Fire boat may be spotted on famous TV series CSI Miami!!!!! Along the sunny coast and waterways of Miami-Dade County there will be a FireStorm 50 fireboat stationed near its main port. 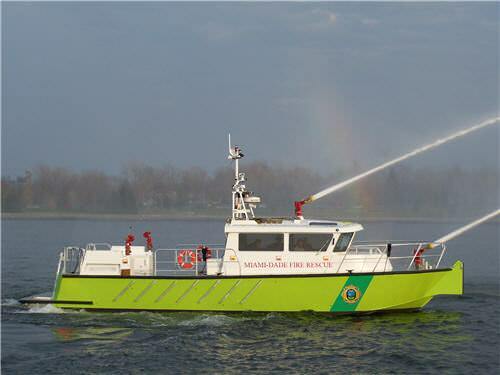 To date this is MetalCraft's fastest Fire/Rescue boat of its size. The vessel is no lightweight either, weighing in at 43,000 pounds and with assistance of the twin CAT C-18's with 873 HP @ 2200 RPM and 364 Hamilton jets it can hit a whopping speed of 40 knots. With the Hale twin 3000's Miami pumps close to an impressive 7000 GPM. Which would be imperative for putting out the most extreme fires on the water or at bay. With a maneuverable workstation on board, it carries medical equipment critical for saving lives. The FireStorm having many added features, one being its infrared system, has the unique capability of night vision, which would be key in locating a missing person in night waters. Captain Carlos Gimenez and his team are excited about the new arrival. The bright green vessel with its large quantity of deck halogen lights can't be missed cruising Miami's shore. Day or night she could be spotted on TV's CSI Miami that is filmed in the same area. Thus being a famous boat for many reasons, but the #1 reason saving lives !!!!!! Miami-Dade County Fire/Rescue has a saying "Always Ready, Proud to Serve" We at MetalCraft are proud to be able to achieve a small part in that. If the FS 50 saves one life it's worth every hour invested the past few months. Four years ago, MetalCraft produced the first FireStorm boat and has not turned back. Each boat having a unique and personalized flavor chosen by our customers. We have been designing and building boats, both power and sail, since 1978 and stand behind our 10-year hull warrenty. For more information please contact Bob Clark or Emily Roantree at MetalCraft Marine Inc. 800.410.8464 or visit us at www.metalcraftmarine.com.